This mod is open source, and may be used in any modpacks. My game crashes randomly when suing this mod...the longetsi ve ben able to play is like 5 mins...i am in 1.13.2 btw :/ any way i can fix it? Can you please file an issue report on our github? https://github.com/progwml6/ironchest, Please give us the crash report you get from the game too! Thanks! The key, by default, would be "g" and it would by default use a lower-ti`er(do not know how to undo the weird e, sorry)picaxe and only use a higher tier one if necessary. Would block of lava with cobblestone, and would automatically place torches. Would mine until bedrock, after which it would clear out an area. Would go around blocks that were not mineable. Would stop mining when the player ran out of picaxes or torches. Would switch to shovel for blocks best broken by a shovel, if there is no shovel the fist is used. There is probably some more features that would need to be added. Mod would most likely be very successful, and I could maintain the page for it. Are you thinking of a name or are you talking about an existing mod? Can I get the list of mods containing copper and/or silver that are compatible with the chest recipes, I want to be able to use them without cheating them in. It uses forge ore dict, only not compatible with mods that do not use ore dict, which is very few. Too bad the "big split" can't be done for 1.12 because too many maps would be impacted negatively. My overfull modpack could stand to be diminished by 120 blocks. Is the 1.13.2 version for Rift or Forge? The link for Iron Shulker Boxes seems to be broken in description. That's because currently it hasn't been published to curse yet. 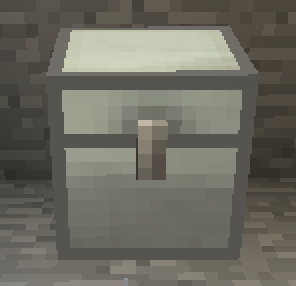 I like the Iron Chests mod bc of the amount of STORAGE.